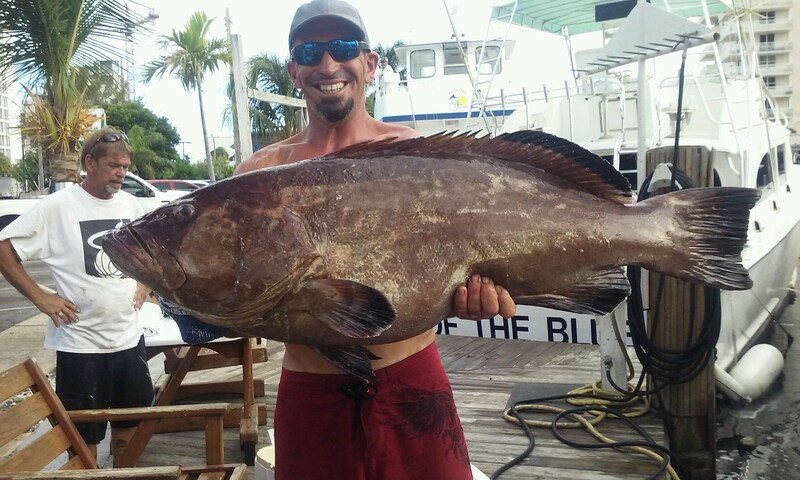 Humongous Black Grouper caught dropping over a shipwreck during our sportfishing charter. 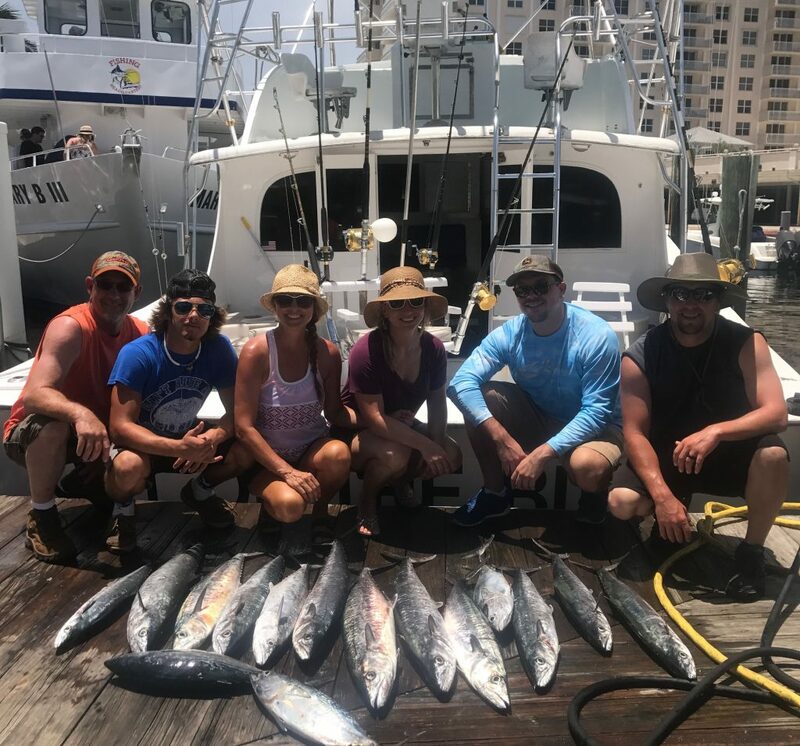 It’s been a hot month for our Fort Lauderdale fishing charters. For one, the temps this year are hot. It’s a good thing we have an air conditioned cabin where you can escape the heat. But more importantly, the fishing is hot too. The reefs are holding some fish. Bonitos are all over the reefs. Bonitos are great because they are good size fish, averaging 8-15 pounds, sometimes even bigger. They also are tremendous fighters for their size. I would say that bonitos rival any fish as the strongest fish in the ocean, pound for pound. The summer months are when the bonitos come through our waters, full force, in numbers that are not even countable. Providing great action on our trolling and drifting trips, bonitos are a revitalizing force that rejuvenates our reefs with lots of fresh activity, of which the effects can be felt many months after they leave. 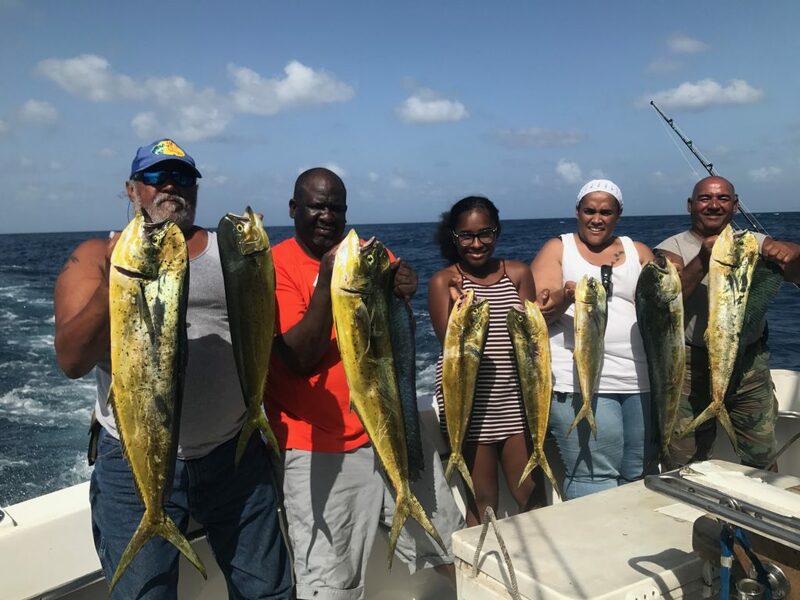 They are our main baitfish source for the whole year, providing baits for our fishing charters to catch everything from small snappers all the way to blue marlin and swordfish. 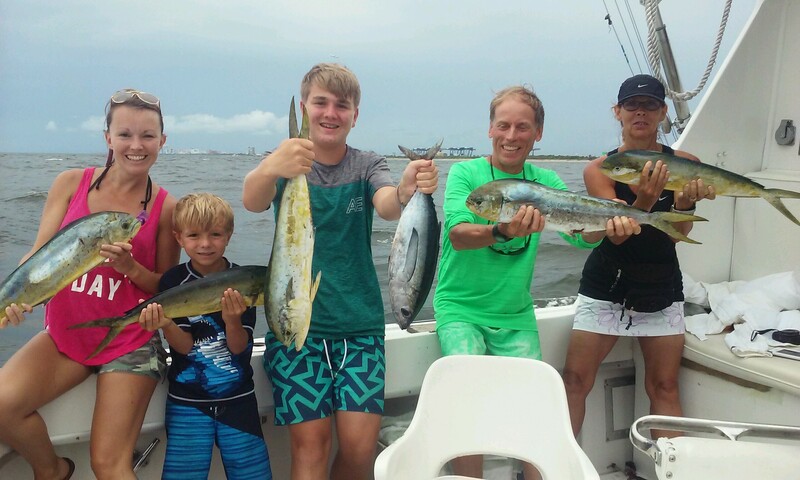 Nice catch of kingfish caught on our sportfishing charter by these fishermen. Kingfish action is awesome this month too. Lots of kings, ranging from 5-15 pounds, are biting voraciously along the 95′ reef off the Ft Lauderdale coast. It had been a tough year for kings up until this month. We hadn’t really had much action on them, just a few here and a few there. This month, they lit up like a brush fire. The past week or better, we’ve been limiting out on kingfish within the first 2 hours of the trip. We have to throw the rest that we catch back. It’s awesome to see the kingfish coming through in such great numbers. Kingfish are actually really good eating fish, they have a bad reputation. This is because people try to freeze kingfish or delay eating it. Kingfish must be eaten right away, or thrown away. You cannot freeze kingfish, it ruins it. Something about the meat doesn’t cure when it freezes, probably the fish oils. Even if it is frozen for only 2 days, it doesn’t eat the same. You must eat your kingfish the same day as you catch it, that’s the rule. Tons of kingfish are hitting the docks this month. August and September are always great months for catching kings. A little barracuda, tuna and wahoo action is mixed in with the bonitos and kingfish frenzy. Most of the fish that we’re getting into are bonitos and kings, but every once in a while, something else jumps on the line. If it’s a surface bite, it could be a barracuda, mahi-mahi or possibly even a sailfish. If it’s a deep bite, it could be a blackfin tuna or wahoo. All those same species live in the same waters that kingfish and bonitos do, and they feed on the same baitfish. 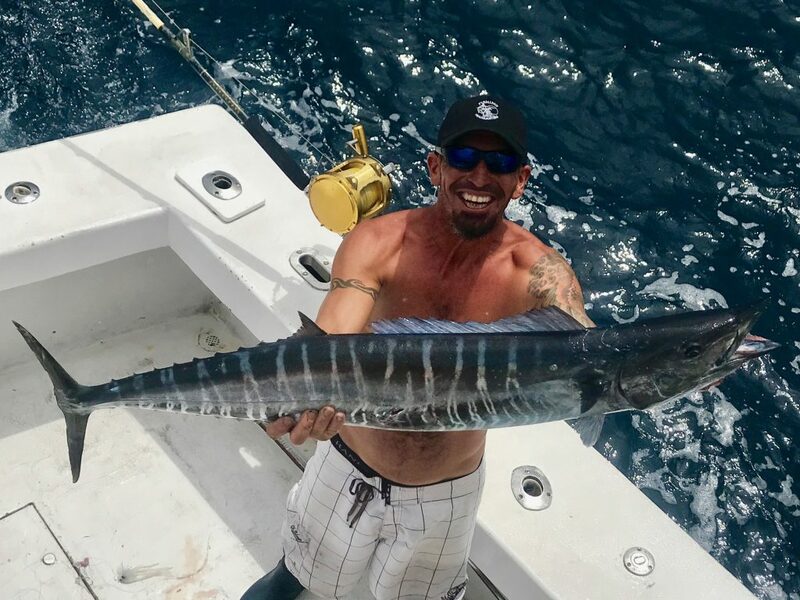 If you are in the zone where you are catching the kings and bonitos, you are in the perfect zone for wahoo, tuna, cuda and sailfish. Anything can jump on the line at any minute when you are trolling. Shark fishing has been awesome as well. Big sharks bite in the late summer, usually bull sharks, duskys or spinner sharks. We caught more sharks this year that I have ever seen caught in a single year. The shark fishing off Fort Lauderdale was simply phenomenal. With all the bonitos and kingfish this year, it’s easy to see why the sharks are here. It’s all about the food. If you want to go out there and go after a sea monster, then a shark fishing charter is the trip for you. We probably have another month and a half of really good shark fishing out here. After that, the sailfish begin to be the preferred big game fish to target. Good luck to everyone fishing over the next few weeks. I will sea you on the water.